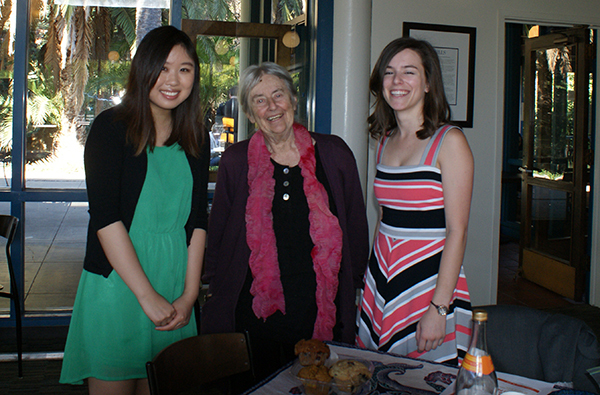 Mills Art History Professor Moira Roth invited my class, Art of the 20th Century, out for a pre-Convocation breakfast in the Tea Shop at 9 a.m. on Friday, September 27. There was already an ongoing breakfast for the graduating Class of 2014 happening that morning in the Student Union but I was curious as to what Moira had in mind as she had always talked about having delightful luncheons and picnics with various art historians and artists during class time. Only one other student, Katlyn Marchini, and I were able to make it and boy, were we both surprised to see what Moira had prepared for us. On top of a plain wooden Tea Shop dining table, Moira unrolled a blue and green paisley floral-print tablecloth, four muffins, a loaf of challah bread, cute matching ceramic plates, paper cups, sparkling clementine juice, and little butter knives that helped set the festive mood. Needless to say, the spread was really something. I thought the conversations were incredibly interesting and had ranged from working in our respective fields (Katlyn at the Rare Book Room in the Library and me reporting for The Campanil) to our unique names to Pokemon (because my last name is similar to the name of the psychic Pokemon, Mew). Melodie Miu, Moira Roth and Katlyn Marchini. I have to say, another year’s ordinary Convocation event was made enjoyable by having attended Moira’s breakfast.